The EPCOT monorail circling past Test Track and the former Odyssey restaurant at dusk, a good representation of how the monorail is not only a means of transportation to and from EPCOT, but also very much a part of the design and appeal of Future World. On Day 1 of EPCOT365, I remarked about the perfect timing of EPCOT Center. Unfortunately my family didn't have the best timing with our first trip to Walt Disney World in the Summer of 1982. However, this missed opportunity only served to strengthen our anticipation for EPCOT Center when we returned in 1984 and that was due, in large part, to the EPCOT Center monorail preview offered to guests in 1982. At this time, there really wasn't a lot of promotion and advertising beyond what you'd read in a magazine or see on television. But Disney had a long history of aggressive marketing of their theme parks and would continue to do that with future theme parks. It started with Disneyland, which was rather ingeniously marketed via its own television show and paved the way for Disney's growth as a multimedia corporation. 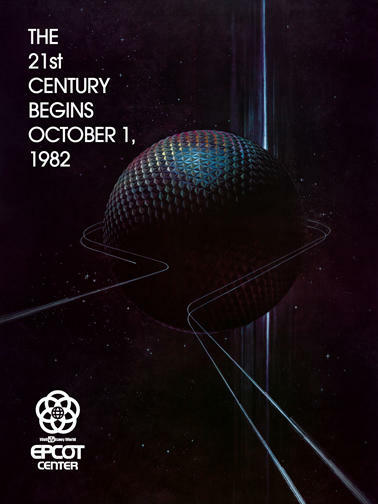 But with EPCOT Center, they had a unique opportunity to offer a preview to guests that took them inside the park, taking them as close to some of the attractions as possible without actually entering the park. The trip to EPCOT from the Ticket and Transportation Center was exactly as it would be now, including the loop around Future World. The key difference was that was as close as you were going to get to those pavilions at that moment (and World Showcase was still going to be a very distant visual). After you disembarked, you could get an up-close view of Spaceship Earth and listen to a brief discussion with a cast member. After that, you returned to the TTC with those quick glimpses, a brochure, and an inspired imagination. For my first four trips to Walt Disney World, we were able to take the monorail almost everywhere, which was a major attraction in and of itself in early era Walt Disney World. The main monorail loop between the hotels and the Magic Kingdom was a spectacular part of those early journeys, but you could see where you were heading from almost every angle. To get to EPCOT Center, you had to journey to a separate part of Walt Disney World property, that at the time could not be seen much at all from outside the theme park. That monorail trip had the added glory of taking you around Future World before stopping to let guests off, enabling the monorail system to be part of Future World itself. It was a symbiotic relationship: the view of EPCOT from the monorail was breathtaking, as was the sight of the monorail looming above while walking around Future World. On the Magic Kingdom loop, it was certainly a spectacle to behold, but at EPCOT Center, the monorail felt very much like it was part of the theme park. Jack Wagner's monorail spiel is embedded in the DNA of every guest who ventured to Walt Disney World in the 1970s and 1980s and the above video thankfully captures that narration while also offering a glimpse of the journey itself. (Credit to metroplan for the video and Michael Crawford at Progress City, U.S.A. for pointing me to it.) I still have very fond memories of my Dad busting my chops and going to grab my hand when prompted by Wagner (and when I was no longer a small child) and we also laughed at Wagner's Spanish translation of "Please stand clear of the doors." To this day, riding the monorail to EPCOT is one of my most cherished experiences visiting EPCOT Center and one of the reasons why the proliferation of bus transportation between destinations has lessened the experience of journeying within Walt Disney World. One of the most enjoyable experiences walking around EPCOT Center in the 1980s was the ambient music that played, virtually everywhere you went and from the moment you stepped off of the monorail. The music was dramatic and whimsical, determined and hopeful, electronic and symphonic. It had just enough of what you expect from the music heard in the Magic Kingdom and Disneyland, but also launched Disney into a whole new era of soundtracking attractions. The above is a complete loop of the EPCOT Center Main Entrance music. I highly suggest plugging in your headphones and finding a quiet place, and let your memory take you back to a more innocent time. Imagine this amazing new world in front of you and this limitless future ahead of you, and a young imagination ready to be filled with 21st century dreams. "But will these seemingly infinite communications become a flood of electronic babble? Or will we use this power to usher in a new age of understanding and co-operation on this, our Spaceship Earth..."
That was the mysterious and exciting tagline used to promote the opening of EPCOT Center, a good 18 years before the actual 21st century would officially begin. It was presumptuous and daring, but also incredibly confident and a bold message that struck at the right time. 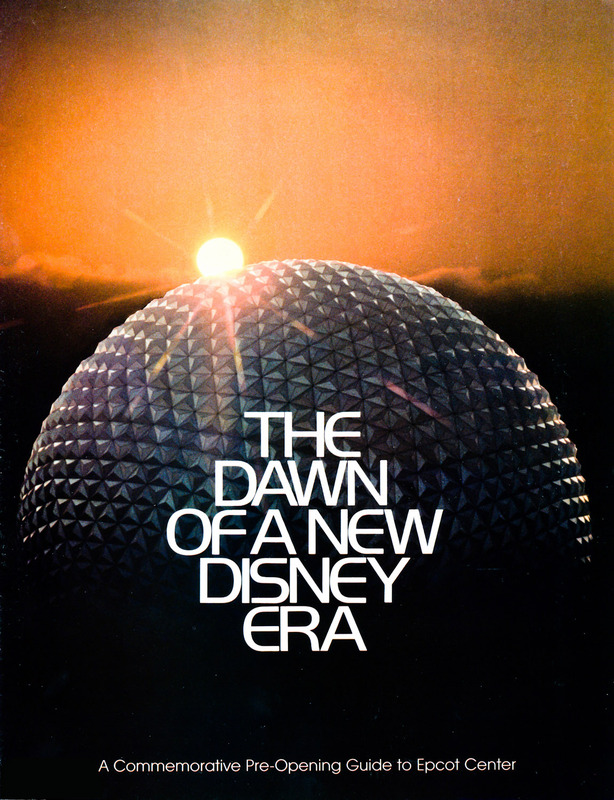 While EPCOT Center was ultimate a testament to Walt Disney's original vision as well as the modified ideas and dreams of the Walt Disney company and its Imagineers, it also had the benefit of being in the right place at the right time. The world was very much infatuated with the idea of modern futurism, which traded Jules Verne for George Lucas, Gene Roddenberry and the pirates of Silicon valley. Major advances in film and music production had created freedoms for their creators to push the art in bold new directions. Computer technology was becoming accessible to the family unit and was starting to be seen beyond the limits of the old DOS interface. A new generation of optimists and dreamers was born to baby boomers and hippies. And a new theme park was being built in Walt Disney World that looked to bottle all that futurism and optimism in a limitless landscape.